What does “mercerized” cotton mean? Mercerization is a process applied to cellulosic fibers – typically cotton (or cotton-covered thread with a polyester core) but hemp and linen can be mercerized also – to increase luster. It is done after weaving (in the case of fabrics) or spinning (for yarns or threads). But early on it was found that the process also had secondary benefits: the mercerized fibers were able to absorb more water, and therefore absorb more dye, making the color of the dyed cloth brighter and deeper. The difference is dramatic: mercerization increases the absorption of dyestuffs by as much as 25%. Not only is the color brighter, it also gives the cloth a better resistance to multiple washings, keeping the colors bright and unchanged over time. In addition to increasing luster and affinity to dyestuffs, the treatment increases strength, smoothness, resistance to mildew, and also reduces lint. So higher quality yarns and fabrics, for example, are always mercerized. The process goes back to the 1880’s. John Mercer was granted a British Patent for his discovery that cotton and other fibers changed character when subjected to caustic soda (NaOh, also known as sodium hydroxide or lye), sulfuric acid, and/or other chemicals. One of the changes was that caustic soda caused the fiber to swell, become round and straighten out. But so what – these changes didn’t impart any luster to the fibers, so his patent was largely ignored. Then in 1890 Horace Lowe found that by applying Mercer’s caustic soda process to cotton yarn or fabric under tension, the fabric gained a high luster as a result of the light reflection off the smooth, round surface created by the NaOH. It became an overnight success and revolutionized the cotton industry. The rest is history. Later testing proved that cotton fiber in its roving state (no twist in the yarns) would absorb more NaOH than fiber in a twisted state and as a result would absorb more water or dye. Since fine, long stapled fiber gives the best absorption with the lowest twist, ( some twist is required for treating under tension to gain luster) it is usually the long fiber types of cotton (Sea Island, Egyptian, Pima) that are selected for yarn to be mercerized. So mercerized cotton fabric starts with a better quality cotton fiber. To get the desired luster and tensile strength, cotton is held under specified tension for about ten minutes with an application of between 21%-23% caustic soda (NaOH) and wetting agents (used to facilitate the transfer of the NaOH into the fibers), at room temperature. Then the fabric is neutralized in an acid bath. You knew I’d have to look at the toxicity profile of sodium hydroxide, which is considered one of the building blocks of chemistry. It’s a very powerful alkali. It’s used in industry in a broad range of categories: chemical manufacturing; pulp and paper manufacturing; cleaning products such as drains, pipe lines and oven cleaners ; petroleum and natural gas; cellulose film; and water treatment as well as textiles. The US Food and Drug Administration (FDA) considers sodium hydroxide to be generally safe, and recognizes it as not being found to pose unacceptable dietary risks, though it is generally only used on food contact surfaces rather than in foodstuffs. The chemical is toxic to wildlife, and the EPA requires that effluent containing NaOH not be discharged into groundwater. Because sodium hydroxide falls in the group of chemicals (salts) which are by far the most often used in textile processing, the sheer volume of NaOH used by the textile industry is important to recognize. Usual salt concentrations in cotton mill wastewater can be 2,000 – 3,000 ppm, far in excess of Federal guidelines for in-stream salt concentrations of 230 ppm. So treatment of effluent is very important, as prevention is the only reasonable alternative to solve the environmental problems associated with this hard-to-treat, high volume waste. I have read that electrochemical cell treatment might be a substitute for using NaOH to mercerize. This process occurs in a low voltage electrochemical cell that mercerizes, sours, and optionally bleaches without effluents and without the purchase of bulk caustic, neutralizing acids, or bleaches. clothing was made from skins of birds and animals. Clothing should be made from hemp fiber. 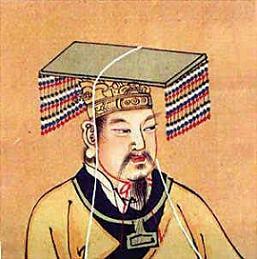 The Yellow Emperor, Huang-Ti, 27th century B.C. Hemp is another word for the plant Cannabis sativa. Yes, marijuana comes from this same plant genus – and so does hops, used to produce beer for millennia. 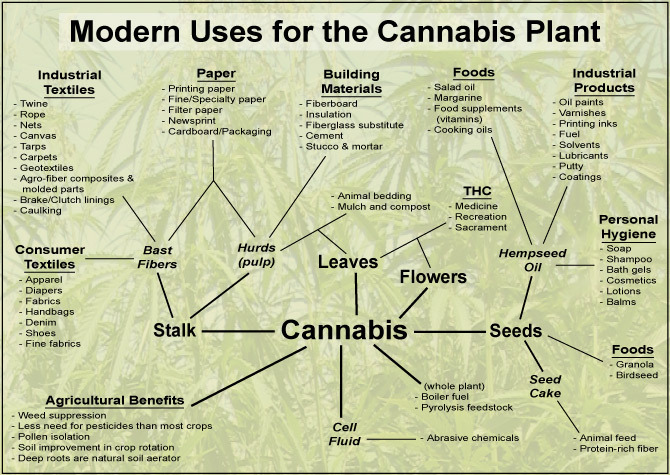 But what we call “industrial hemp” is a different variety (or subspecies), called Cannabis sativa sativa. Marijuana is from Cannabis sativa indica, which is bred to contain between 5 – 10% of the intoxicating substance delta-9 tetrahydrocannabinol, or THC. Industrial hemp, Cannabis sativa sativa, contains less than one tenth that amount. Industrial grade hemp is not marijuana – it doesn’t look the same and if you tried to smoke it you’d probably die of carbon monoxide poisoning before you felt anything but sick. For more about the differences between the two varieties click here or go to the Industrial Hemp website. In 1941 Henry Ford built a car with a plastic made from hemp and wheat straw. Both George Washington and Thomas Jefferson grew hemp on their plantations; in fact the colonial government mandated that people grow hemp. Settlers used hemp fiber as money and to pay taxes. The original Levi Strauss jeans were made from hemp. The July 4, 1776 Declaration of Independence was written on hemp paper. The plant has been used for millennia for food, fibers and fuel. Today it is said that over 30,000 different products can be made from hemp. Hemp’s oilseed makes high-grade food and beauty products. The stalks produce fiber and cellulose. And today, because of its length and strength, hemp fiber is woven into natural advanced composites, which can then be fashioned into anything from fast food containers to skateboard decks to the body of a stealth fighter. There are over two million cars on the road today with hemp composite components. But hemp for luxurious fabrics? I remember those macramé plant hangers that were all the rage in the 1970’s. Hemp has a public relations campaign to wage, because when I thought of hemp a few years ago (before my enlightenment) all I could imagine was burlap bag and sisal rugs. Turns out the technical revolution has even found hemp: new developments from the 1980’s in retting and processing the stalks has meant that the hemp fibers produced today are soft and lustrous enough for even the finest fabrics. Many end users look for comfort and durability in choosing a fabric, so hemp’s softness and high abrasion resistance make it a competitive choice. Hemp fiber’s positive qualities have been recognized over thousands of years of real life applications. The texture of pure hemp textiles resembles that of flax linen, appealing to the eye with its subtle variations in thickness, but it is also versatile and can be blended with other fibers to create many different looks. Hemp’s versatility as a textile is stunning: hemp fibers can be woven alone or with other fibers to produce weaves from rugged canvas to the lightest, silkiest gauze, in an unlimited array of colors and finishes. Hemp has a beautiful natural luster and a lush hand and drape not found with any other natural or synthetic fiber, even linen. Hemp is stronger and more durable than any other natural fabric, including linen, which almost matches hemps abrasion resistance and tensile strength. The result is that hemp has a longer lifespan than other natural fabrics. (Patagonia is just one of the many companies which has published studies which demonstrate hemp’s superior strength; results for these studies range from 3 to 8 times stronger.) Products made from hemp will outlast their competitors by many years. Not only is hemp strong, but it also holds its shape, stretching less than any other natural fiber. This prevents hemp fabric used in upholstery, demountable panels, acoustic paneling or as wallcovering from stretching out or becoming distorted with use. Hemp fabric withstands, even benefits from, commercial laundering. Its inherent luster and light reflective qualities are enhanced by washing; it becomes finer and more luxurious with use. Hemp also possesses excellent soil-release properties because it sheds a microscopic layer each time it is laundered. This eliminates soiling and exposes a fresh surface. In effect, this means that hemp retains its sleek sheen every time it is washed, that it never dulls, and that it releases stains more easily than other fabrics. Hemp may be known for its durability, but its comfort and style are second to none. The more hemp is used, the softer it gets: it wears in, not out, thriving on regular use and machine washing without suffering fabric degradation. Hemp actually becomes softer, more resilient and more lustrous as a result of washing. Hemp’s superior absorbency, due to its porous nature, means that it is very breathable and quick drying. Hemp can absorb up to 20% its own weight while still feeling dry to the touch (vs. polyester, which can absorb a maximum of 6%). This is important in the case of any fabric that is in contact with human skin, such as sheets, as perspiration is rapidly absorbed. It feels cooler in summer yet during cool weather, air which is trapped in the fibers is warmed by the body, making it naturally warm. Hemp’s absorbency allows it to accept dyes readily and retain color better than other natural fibers, including cotton. Hemp has a high resistance to ultraviolet light; it will not fade or disintegrate from sunlight as quickly as other natural fibers. (Tilly Endurables introduced a new hat in 2004 after testing its hemp fabric to a UPF of 50+, the maximum ultraviolet protection rating given.) UV damage is especially a problem for draperies and marine interiors, so hemp would be a good natural fiber choice for these applications. Hemp fiber is highly resistant to rotting, and its resistance to mildew, mold and salt water led to its premier use in marine fittings: the majority of all twine, rope, ship’s sails, rigging and nets up to the late 19th century were made from hemp. The word canvas itself is derived from cannabis. Finally, any product made of hemp is fully biodegradable and easily recyclable. Hemp grows well without the use of chemicals: usually no pesticides or fungicides are used because it has few serious fungus or pest problems – although the degree of immunity to attacking organisms has been greatly exaggerated. Several insects and fungi specialize exclusively in hemp! But despite this, the use of pesticides and fungicides are usually unnecessary to get a good yield. No herbicides are generally used because dense plantings shade out weeds; no defoliants are needed (as they are with machine harvested cotton) because the dried foliage is not a problem for harvesting. Hemp requires less water to thrive than cotton – is actually drought tolerant – and usually grows well without irrigation. Globally, 77% of cotton crops are irrigated. 121 – 445 lbs. 80 – 102 lbs. 323 – 465 lbs. 62 lbs. 485 – 809 lbs. This yield translates into high biomass, which can be converted into fuel in the form of clean-burning alcohol, or no-sulphur man-made coal. The most widespread claim for the environmental friendliness of hemp is that it has the potential to save trees that otherwise would be harvested for the production of pulp. If hemp reduces the need to harvest trees for building materials or other products, its use as a wood substitute will tend to contribute to preserving biodiversity. Hemp may also enhance forestry management by responding to short-term fiber demand while trees reach their ideal maturation. In developing countries where fuel wood is becoming increasingly scarce and food security is a concern, the introduction of a dual-purpose crop such as hemp to meet food, shelter, and fuel needs may contribute significantly to preserving biodiversity. Journal of the International Hemp Association. Vol. 1 (1994)–Vol. 6 (1999). (Vols. 1–5 and part of Vol. 6 available online at mojo.calyx.net/~olsen/HEMP/IHA/). Superseded by Journal of Industrial Hemp. Journal of Cannabis Therapeutics. Hawarth Press. Vol. 1 published 2001. Journal of Industrial Hemp. Haworth Press. Vol. 1 to be published 2002. Kerr, Nancy, PhD, “Fabulous Fibers? Can hemp compete with natural and manufactured fibers?” AgFibe2002 conference, Winnipeg, MB, Nov. 13 – 15, 2002. Press release, Tilly Endurables 2004; also see http://www.backpackgeartest.org/News/article.php?story=20050210193045692.